The tips that work for us. 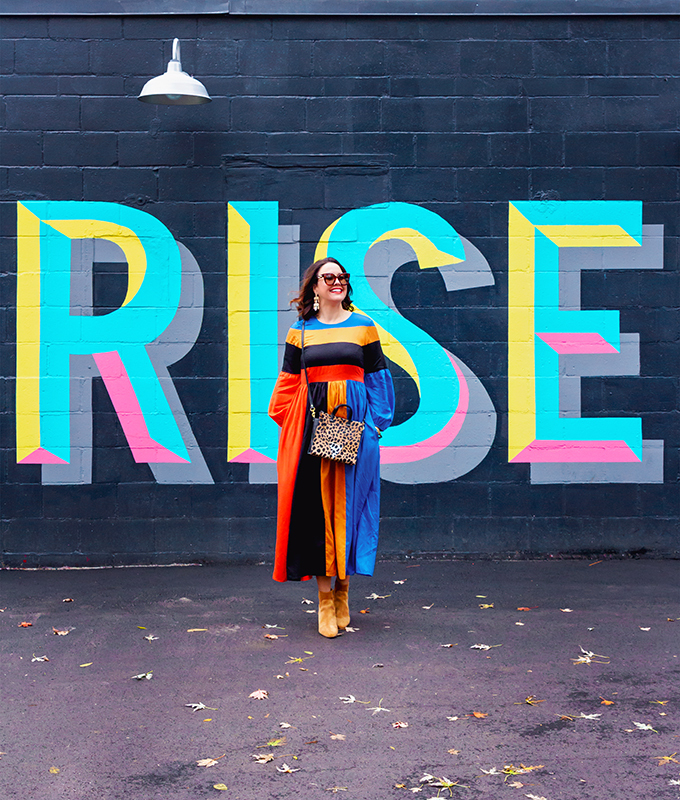 Fashion should be fun, and what’s more fun than a great print? Well, we’ll tell you what is: multiple prints! That’s right – more is more when it comes to prints, in our minds. More prints, please! We’ve been big fans of print mixing for a while now, as evidenced by this article and this article, both from 2015! Indeed, mixing prints is not just a short term trend. Actually, mixing prints successfully is a sure fire way to elevate your street style! 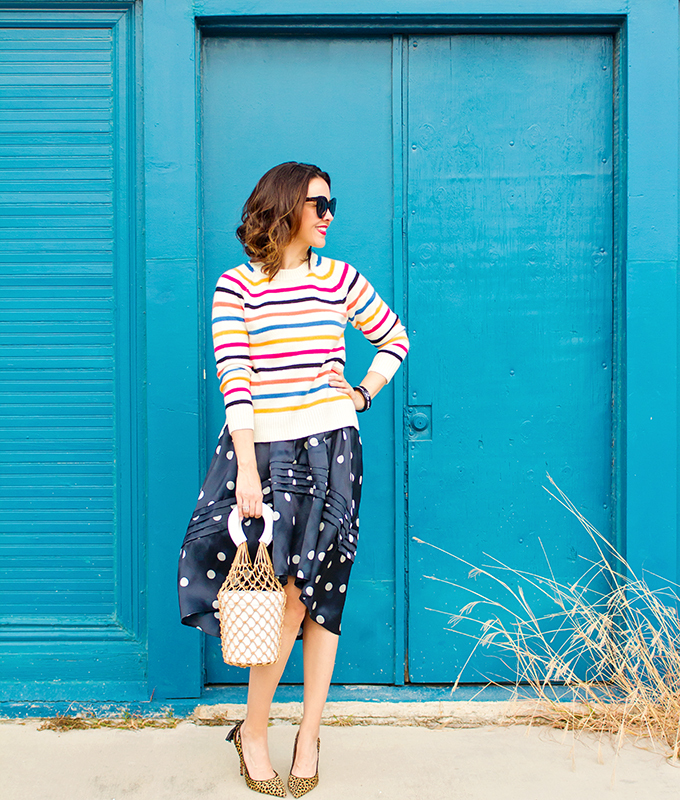 Do stripes and polka dots go together? Can you wear florals and polka dots together? 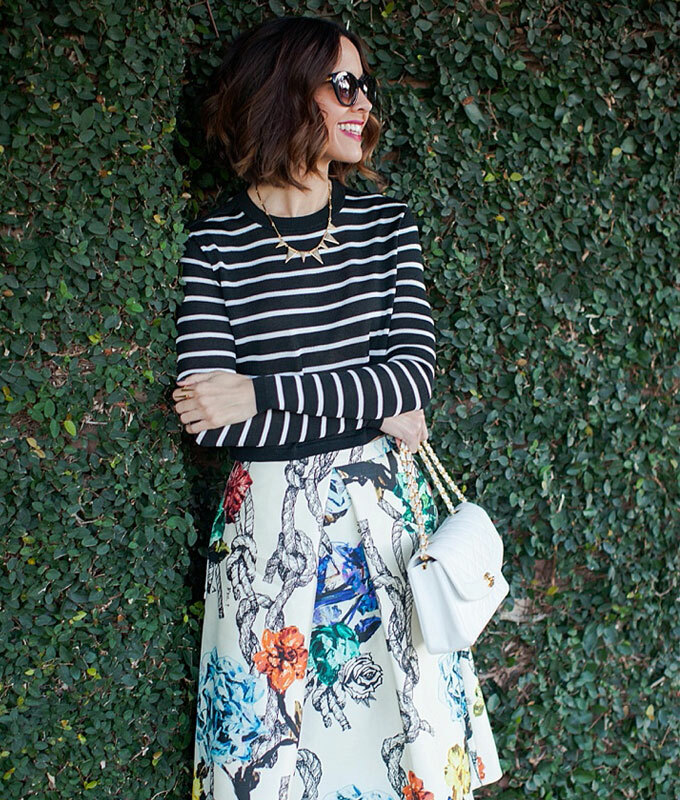 Do florals and stripes work together? Can you wear the same print twice? Then, keep reading for print mixing 101 – and beyond! Before you know it, you’ll be mixing prints like a pro! So, what are the so-called rules to print mixing? 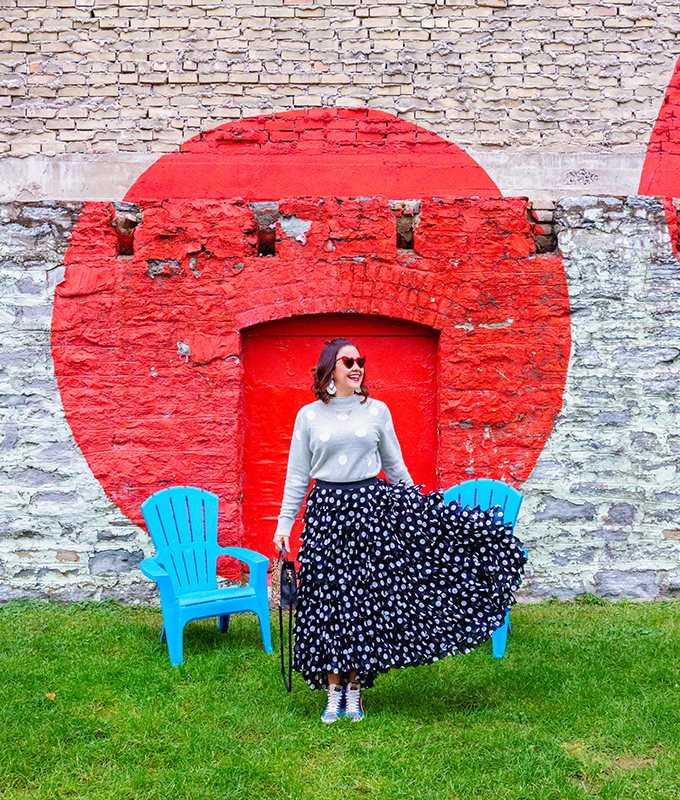 Well, since we like to throw fashion rules out the window, let’s call these our top print mixing tips. This one tip will change your fashion life! Ask yourself: is there a unifying color between the two prints? This is the simplest and easiest ways to ensure a common thread (no pun intended!) between two prints. An exact color match is the most straightforward. But you can also achieve print unification via shades of the same color. You’ll be surprised at how many pieces from your closet that you can mix and match! For instance, check out the look above. 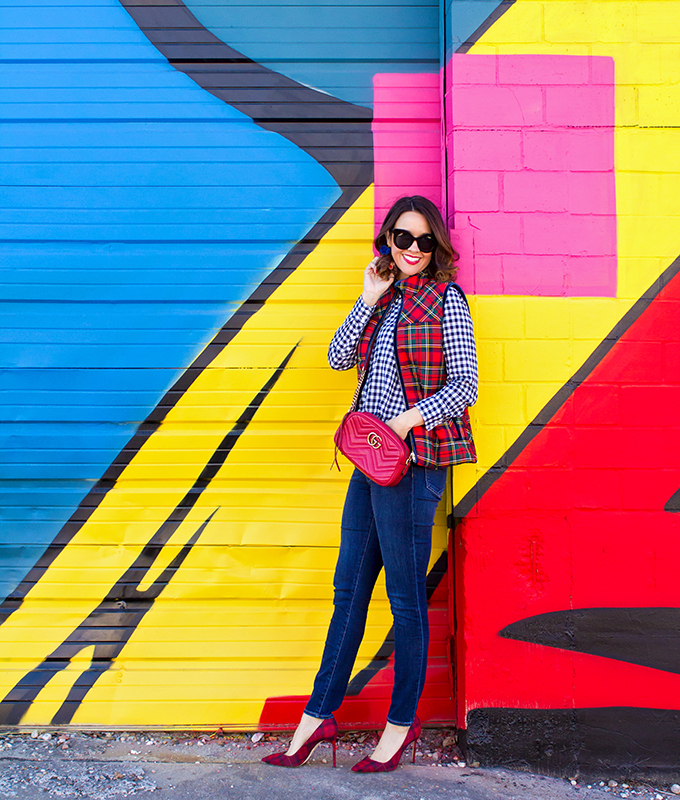 To some, these polka dot jeans might not seem versatile. But to me, they are quite versatile. The soft gray color of this polka dot jeans ties in quite nicely with the gray tones in the stripes of this sweater (also here). Just look for that common color! 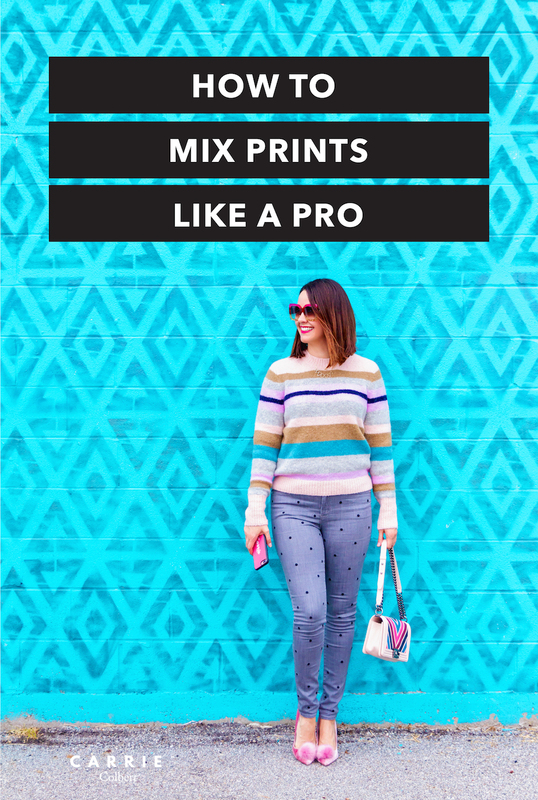 Mixing all sorts of big scale prints at once will land you on the hot mess express! To keep this fashion faux pas from happening, study the scale of prints. 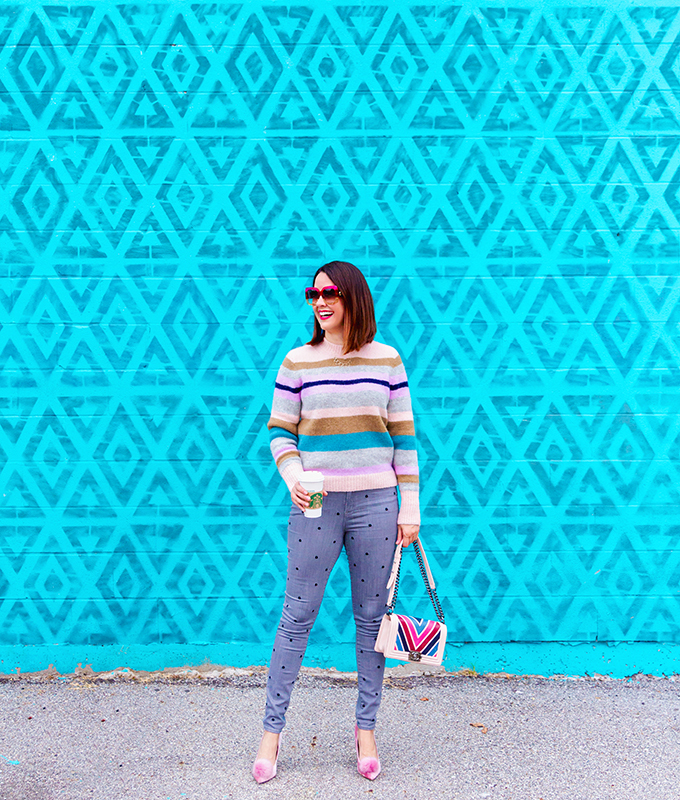 Let’s take a gander again at the striped sweater and polka dot jean look from above… Not only is there a unifying color (gray), but there is also a variation in the scale of the prints. The polka dot is subtle, while the stripes are bold. The lesson here: the prints should complement one another – not compete with one another. You want one print to be dominate visually. This tip is particularly handy if you are mixing two of the same prints. 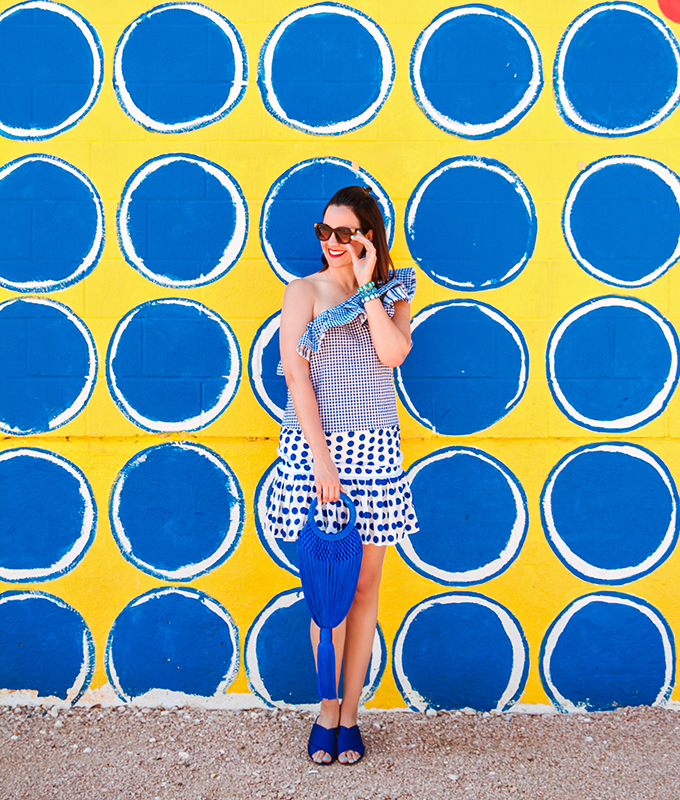 For instance, if you’re pairing two polka dot prints, make it visually interesting by varying the size of polka dots. They’re called classics for a reason. Lean into them when it comes to print mixing. In particular, stripes and leopard print both can act almost like neutrals. They go with practically anything! 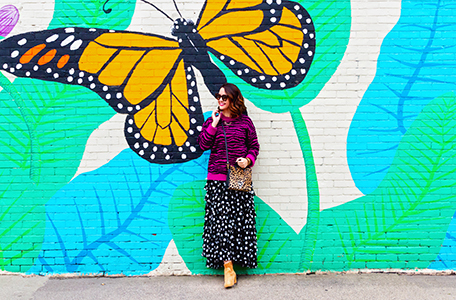 Indeed, the easiest (and best) print mixing techniques often start with either a striped piece or a leopard print. 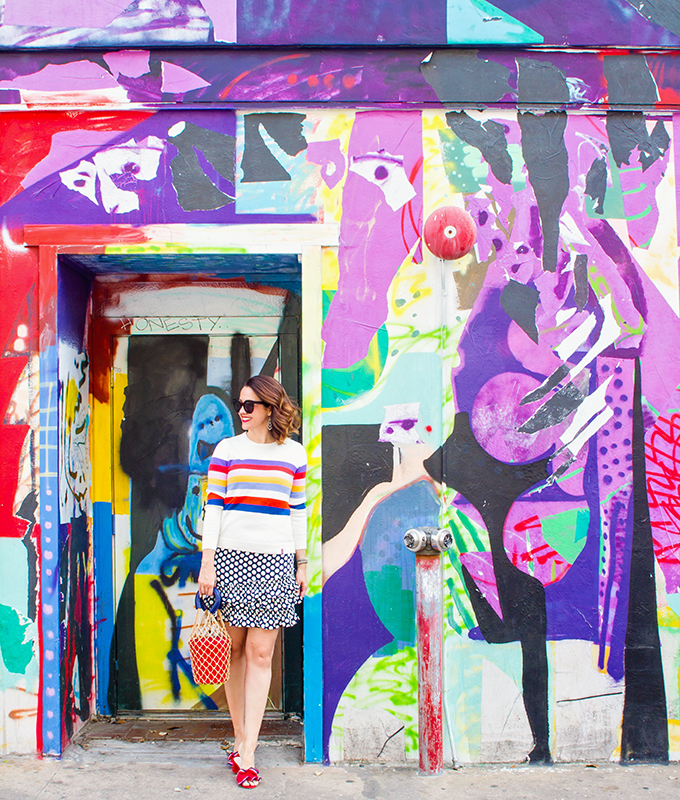 Did you see how I threw in a leopard purse with the bold striped dress above? Some might have thought to play it safe with such a vibrant dress which already incorporated a striped pattern. But au contraire! I tried to make the look more visually interesting by incorporating a leopard bag. Note that this works because (1) there is a unifying color, (2) there are varying print scales, and (3) leopard acts as a neutral. Speaking of neutrals, solid, neutral-hued pieces have a place in the pattern mixing discussion. If you don’t want to do printed look from head to toe, break it up some. How do you break up the prints? Incorporate some solid, neutral items into the look. Take the guesswork out of print mixing! Buy an item that has already done the print mixing work for you. Could it be any more simple to embrace mixed prints this season? I think not! In fact, I’m noticing an abundance of clothing items with built-in print mixes this season (some of our favorites below). This dress in particular wins all the print mixing heart eyes from me! Editor’s note: I’ve had the best success in print mixing when I’ve embraced two of these tips simultaneously. Above all, don’t over think it too much. 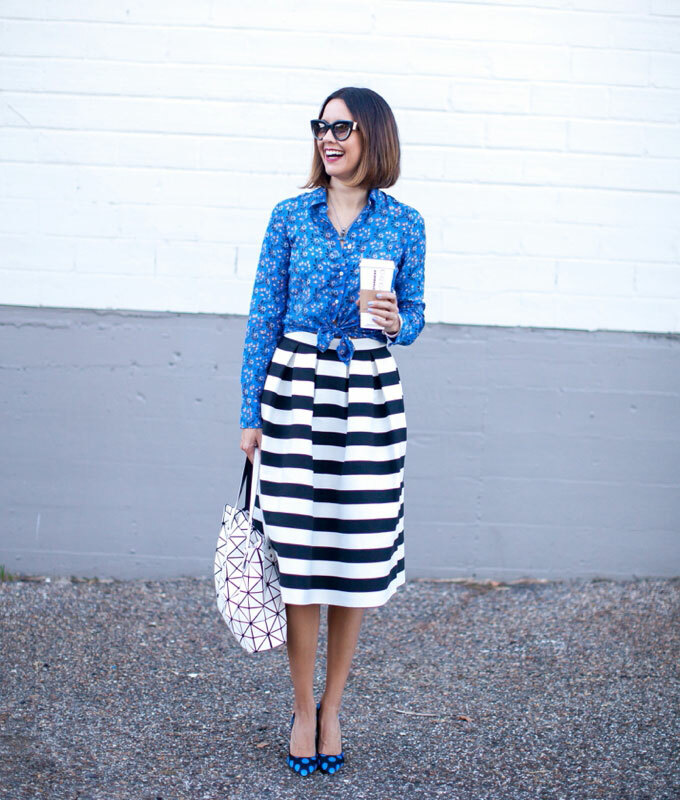 Again, fashion should be fun, not stressful – especially when print mixing! So, while these rules are the most important ones we believe when it comes to styling prints, you truly can do whatever feels right to you. Read more about stripes here. Read more about polka dots here. 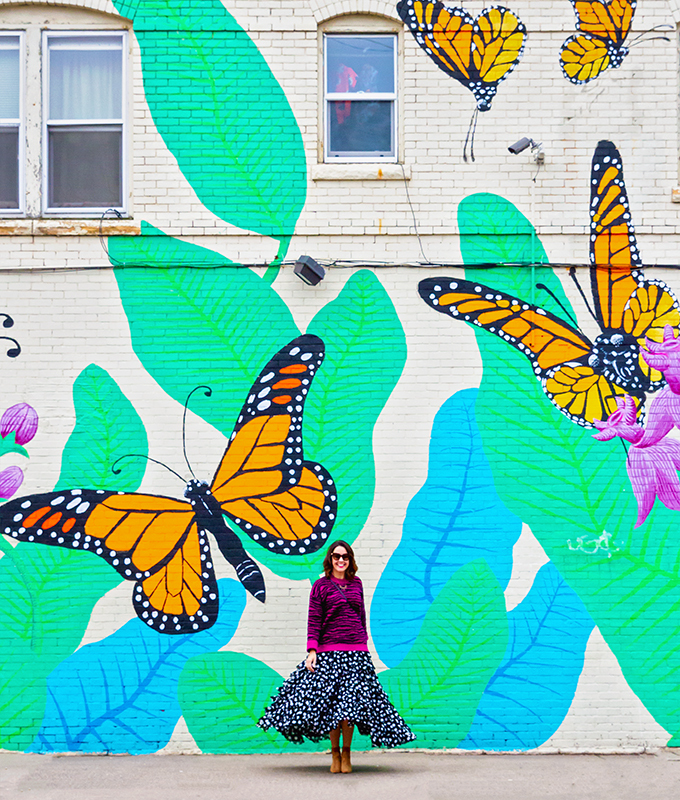 Read more about florals here. Fashion is meant to be fun! So, have fun mixing and matching prints in your closet. You may win some, and you may lose some. But when you nail a mixed print look, you’ll feel like a total fashion pro! What are your thoughts on print mixing? Do you love it as much as we do? Let us know in the comments below! Also let us know what you’re eyeing from above. Would you like to jump on this 70's trend train? A 70's inspired jumpsuit is a great place to start! Check out my jumpsuit, plus 11 more fabulous options! Plush animals, hair bows, books, and more!